Day four of Aero India 2011 had its share of high-profile visitors, including Indian cricket team captain M S Dhoni and actor Shahid Kapoor. Tata Group Chairman Ratan Tata and Member of Parliament Naveen Jindal had earlier dropped in at the country's largest air show going on at the Yelahanka Air Force in Bengaluru. 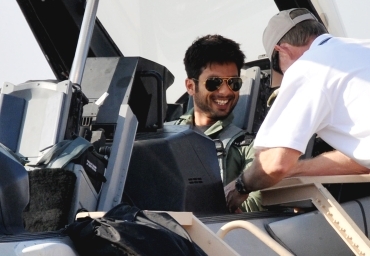 Kapoor took to the skies in a Lockheed Martin F-16 fighter aircraft, and later termed it a great experience. "This experience would help me as I am playing a pilot in my next film Mausam. As a child, I always dreamt of becoming a pilot in the Indian Air Force," said the actor. Kapoor had to undergo a month-long rigorous training and pass the requisite tests before flying the combat aircraft. "I think it is a privilege to get this opportunity. It was a thrilling experience," said Kapoor. The show's other star attraction was Indian cricket team's captain M S Dhoni. 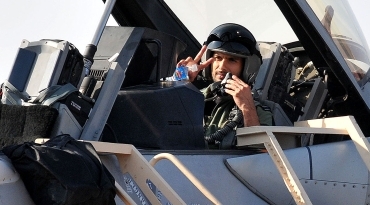 Rumours suggested that though Dhoni was keen on flying a fighter aircraft, the Board Of Control for Cricket In India dissuaded him from doing so. The BCCI didn't want him to undertake such a venture barely days before the cricket World Cup, which kicks off on February 19.